Coos Bay, Oregon is a fun place to travel to on the Oregon Coast, located South of Florence and West of Roseburg it is a popular south coast city that is home to a wide range of fun activities. The bay itself is a wonderful place to go sight seeing or get out on the water in a kayak for just a great day of exercise and nature watching. 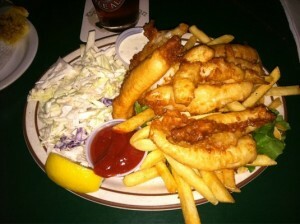 There is a large fishing community that moors in Coos Bay. Tenmile lake is also just a little north of the main city which is a popular freshwater destination on the coast. If you are visiting Coos Bay then you may want to consider stopping at the following local businesses for a sweet treat or a lunch or dinner. Coney Station located next to part of the bay is a great eatery that serves over 20 different beers on tap making it a great place to stop for a drink and a burger or other delicious items. They have a healthy selection of seafood entrees as well. 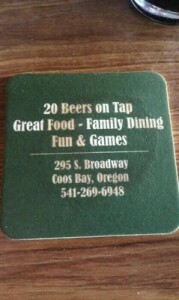 This is a great hang out spot and perfect if you were spending a day at the beach and want to grab a bite to eat for lunch before continuing with your day trip to the Coos Bay area. It has the neighborhood bar type feel with a couple of pool tables and a great selection of brews. Not the best place to come and hang out with the family, but perfect for a day trip lunch or dinner stop. The Cranberry Sweets Company as seen on the Rachel Ray show is a great local candy shop that makes lots of awesome desserts and treats. If you are a chocolate or candy lover then you will want to include a stop to the factory store in Coos Bay on your next visit. This local treasure has been in business for 50 years. They specialize in making many wonderful fruit based candies with Oregon berries and fruits. They also have an excellent line of brittle’s, toffee’s and caramels or you may just enjoy picking up a package of tea cookies and finding a drive through coffee shop for an espresso or a hot tea and enjoying a snack at a viewpoint looking the bay. This can be a perfect way to enjoy a stop in Coos Bay especially on a raining winter day when you may not want to be out on the beach or bay.